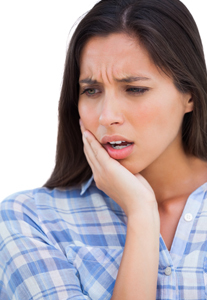 Broken Tooth: Is It an emergency or not? Have you ever had that sinking feeling after biting into something soft and chewy and feeling something hard and crunchy instead? You’ve chipped or broken a tooth, but what should you do next? First try to assess the damage by determining whether it’s a chip or a whole tooth. As Dr. Jeff and Amber Reinking will tell you, a broken or chipped tooth is usually not a dental emergency unless you are experiencing a great deal of pain or bleeding, but you should contact us for an appointment shortly afterward. Be sure to mention that you have a broken tooth so we can fit you into our schedule quickly. After a thorough evaluation, we’ll recommend a course of action. If it is a small chip, we may simply smooth it out. For a larger break, the dentist may fill in the space with a composite material that matches your other teeth. If you are in severe pain, are bleeding excessively, have a major break, or have lost a tooth, that is a dental emergency and you should contact us. As emergency dental specialists, we’ll be able to schedule an appointment immediately and advise you on the next steps to take. You can rinse your mouth with warm water and apply pressure to stop the bleeding. An ice pack will help reduce any swelling. Do not take any aspirin as that could increase the amount of bleeding. Should your tooth be knocked out completely, rinse it under running water but do not scrub it. Hold the tooth only by the crown, or the part you normally see above the gum line, not by the root. If you can, put the tooth back into the socket while you travel to our office, or put it in a mild salt solution or milk. Don’t let the tooth become dry, because this can lead to damage. Once you get to our office, our dentist will determine whether the tooth can be saved or if it will need to be replaced. A broken tooth may not always be an emergency, but it’s best to have it treated with us at Tri State Dental Care. While it may only be a cosmetic problem at first, if left too long without treatment, you may experience further damage to your tooth and mouth.